There’s nothing quite like an amusing or quirky gadget to make a routine – or even unpleasant – task seem a bit more fun, and pest control is certainly no exception. While all those mousetraps and pesticides obviously have their place and represent the serious end of the business, as a swift look through a few mail order catalogues or online search will soon show, there’s no shortage of more light-hearted ways to deal with problem pests. There are loads to choose from, but here’s a quick guide to five of our favourite gizmos. For a few pounds, why not try your own battery-powered, mini version of the insect-electrocuting devices you commonly see in food shops? They’re a fast, effective and – however un-PC it sounds – great fun way of slaughtering those annoying flying bugs in and around your home. Most of them come incorporated into brightly coloured, plastic fly-swats, but there are even ones that come as replica tennis racquets, which is ideal if you fancy yourself as a bit of a closet Andy Murray or one of the Williams sisters. It’s a real win-win – hordes of zapped flies and you get to practise your hand-eye coordination at a fraction of the cost of a games console! 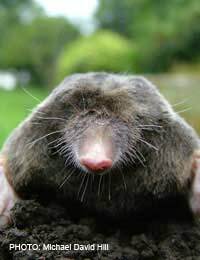 For the reluctant pest controller, a solar powered mole deterrent has to be close on the perfect gadget – it’s green and non-lethal too. The device couldn’t be easier to use. Just drive the spike into the ground close to the mole hills and switch on; the on-board photovoltaic cell charges the battery and a sound generator inside emits a sonic pulse that moley simply can’t abide. It’s a variation on the time-honoured approach involving half burying bottles or sticking a few kiddies’ windmills into the ground to generate a subterranean noise – and it seems to have worked for a lot of people. If you don’t like the idea of calling in the professionals to rid you of your problem permanently – and lethally – then this might be just the gizmo for you. As pet owners know only too well, fleas are remarkably persistent pests and when estimates suggest that there are as many as 10 times the number of fleas actually living on Fido or Tiddles lurking in the carpet and soft furnishings around your home, that’s not good news! Part of the key to their success is their remarkable ability to sense an animal’s body heat to find a new meal-ticket, once they get hungry and that’s where the electric flea trap comes in – by using it against them. It’s another delightfully simple idea, consisting of a small plastic enclosure, an electric heat source and a sticky pad. Put the sticky pad into the unit, switch on and stand back as the artificial ‘body heat’ lures unsuspecting fleas out of hiding and to their doom as they get stuck inside. If you’re after a no-mess solution that doesn’t involve sprays, powders or pesticides, it’s a great gadget for cleaning up your home – though de-fleaing the dog is another matter! For problem visitors of a larger kind – whether that’s nocturnal foxes raiding your bins or next door’s moggie using your vegetable patch as a handy loo – a motion activated device that delivers a quick squirt from your garden hosepipe could be the answer. They use the same basic technology that lies behind security lights, only this time instead of merely illuminating the problem, they help it on its way with a swift and icy blast of cold water! Of course, it can only protect a relatively small part of your garden, but if you have an outside tap and a handily placed – and safe – power socket, having your very own water cannon might be just the solution for you. Mr Yellow Jacket is the bane of almost any picnic or garden BBQ – but he doesn’t have to be if you invest in a simple wasp trap. Just fill the plastic reservoir with any of the sort of sweet sugary liquids that wasps find so irresistible, fit the lid and hang it up near where you’re eating and enjoy a sting-free outdoor meal at last, as the wasps themselves enter and drown in the source of their attraction. Talk about making the punishment fit the crime! It’s a variant of something that beekeepers have been using for years to stop wasps raiding their hives, and while it’s possible to make one yourself, for the small amount of money involved, it’s hardly worth the effort. This is only a tiny selection of the ingenious and effective gizmos that people have come up with to make the whole business of pest management a little less serious, so if you’re a gadget junkie with a pest problem, then you really are in for a treat. Even if gadgets aren’t normally your thing, it’s worth a look to see what’s available – you might just get converted! These gadgets can easily be used from pests killers, and not just in yor home, but all over the world. I have a young olive tree in a pot outside. It’s under attack from something. There’s a dry froth around some of its leaves. Later the leaves dry out and die. What should I do?